The Nevada State Railroad Museum has four flat cars in its collection originally built around 1904 by J. S. Hammond & Co. of San Francisco for the Sierra Nevada Wood & Lumber Co. of Overton (later Hobart Mills) California, near Truckee. The design of these wood framed cars was actually typical of construction in the 1880s, but was well suited to the needs of the SNW&L. SNW&L had a narrow gauge rail line into the woods to haul in logs for its sawmill in Overton. From the mill to the Southern Pacific interchange in Truckee, the company built a standard gauge line to haul the cut lumber. This was the primary service of the four flat cars in the Museum's collection. In later years, the company incorporated the standard gauge line as the Hobart Southern Railroad. The numbers of most of the flat cars has been lost to time, but one of them was Hobart Southern No. 47. In 1938, Paramount Pictures purchased the four cars for the movie Union Pacific. The studio kept them with its V&T equipment, selling all in 1971. 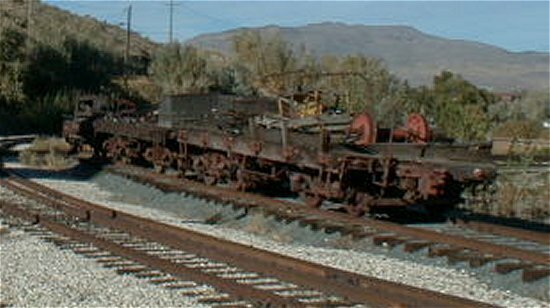 Short Line Enterprises purchased the four flat cars and subsequently sold them to the State of Nevada for preservation. They are all presently awaiting their turn for restoration.